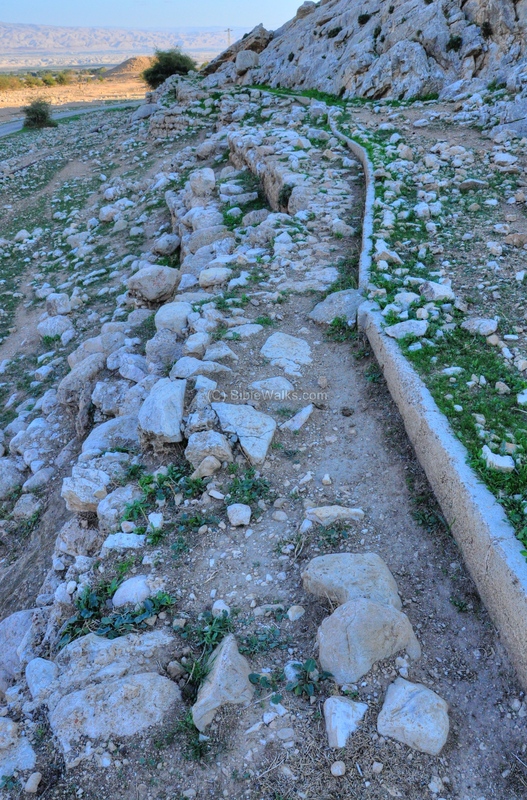 The aqueduct, seen along the southern bank of the brook, once supplied water to the Herodian city of Fazael (Phasaelis) and was also used for farming. 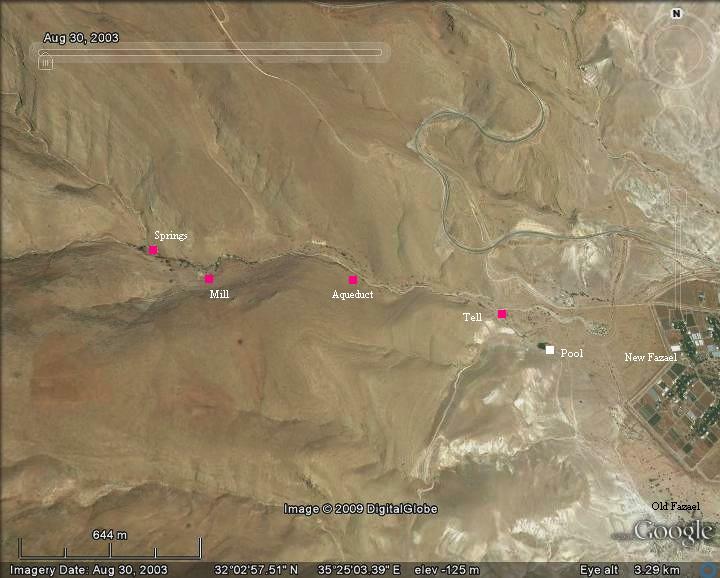 The aerial map below shows the east side of Fazael brook (Hebrew: Nahal Fatsael). 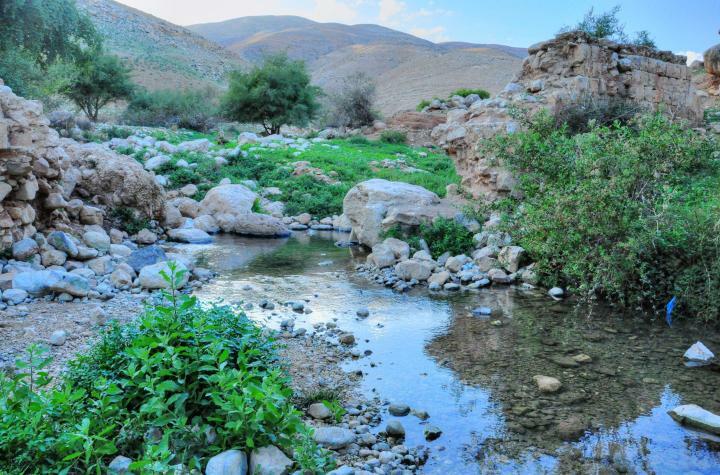 The total length of the brook is 11KM and this web page focuses on its eastern section - closer to the Jordan valley. The springs are accessible by car on a dirt road which starts 0.5KM west past the entrance to Moshav Fazael. The area of Fazael brook was inhabited in the prehistoric periods. A large site (350 Dunams) was located at the mouth of the brook, dated to the late Chalcolithic period (4,000-3150BC). The sites then were deserted until the Iron age. An Israelite settlement was established on Tell Sheikh es-Dhiyab, a small mound on the edge of the brook. It existed from the 10th C BC until the 8th C BC, during the Israelite Kingdom. 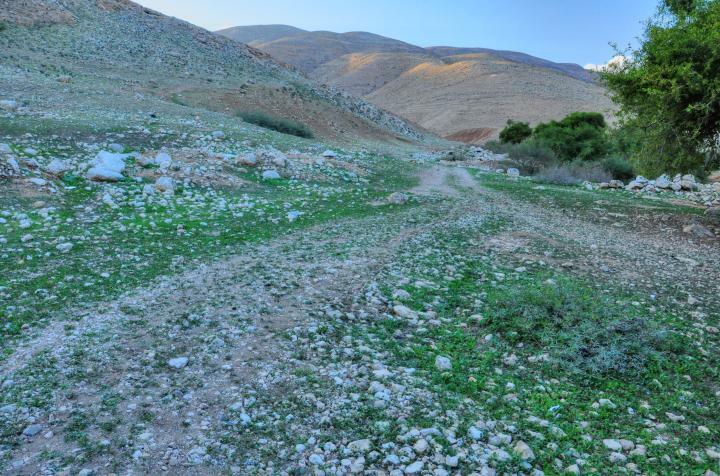 This site is identified as Ataroth (Joshua 16 5,7: "And the border of the children of Ephraim according to their families was thus...And it went down from Janohah to Ataroth, and to Naarath, and came to Jericho, and went out at Jordan". Another identification is a Levite city called Jokmeam (1 Chronicles 6 64,68): "And the children of Israel gave to the Levites these cities with their suburbs...And Jokmeam with her suburbs". During the time of King Herod, the Jordan valley witnessed an unprecedented growth, which included construction of new roads, villages and water supply systems. The Fazael valley was one of the areas that benefitted from this growth. 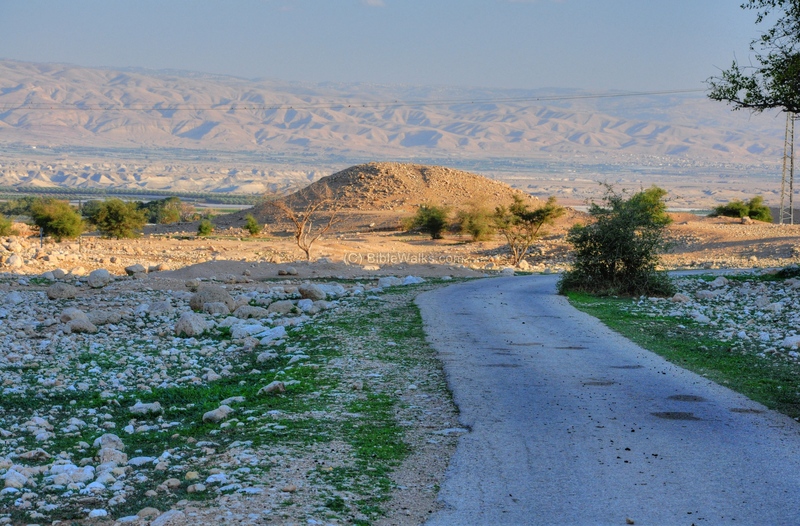 Herod established the desert town of Fazael (Phasaelis) on his estate, and named it after his brother. 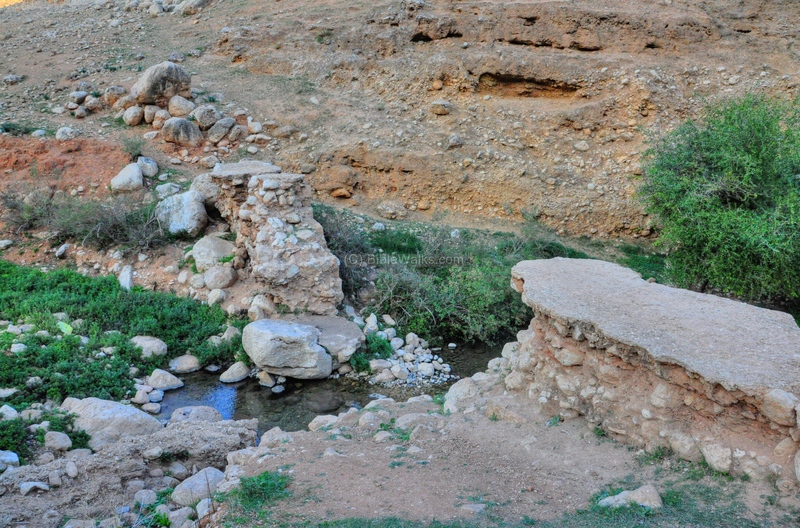 The water supply for the town came by an aqueduct from the springs of Fazael brook, about 6KM to the north-west. 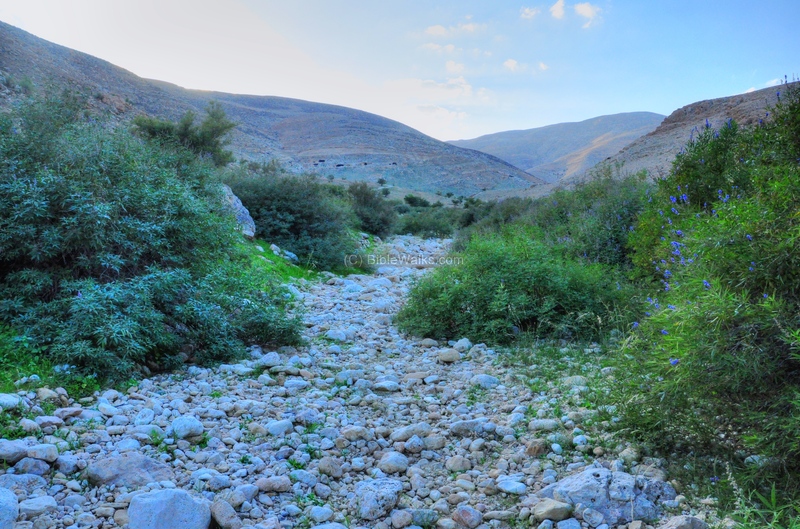 Its waters were collected in a large reservoir (40x40x8m) which is located on the west side of Moshav Fazael. The water supply was used also for its palm trees, which gave the town its fame and income. After Herod's death (4BC), Herod's sister, Shelomit, inherited the town and the estate around it. After her death the estate was given to Livia, Augustus's wife. 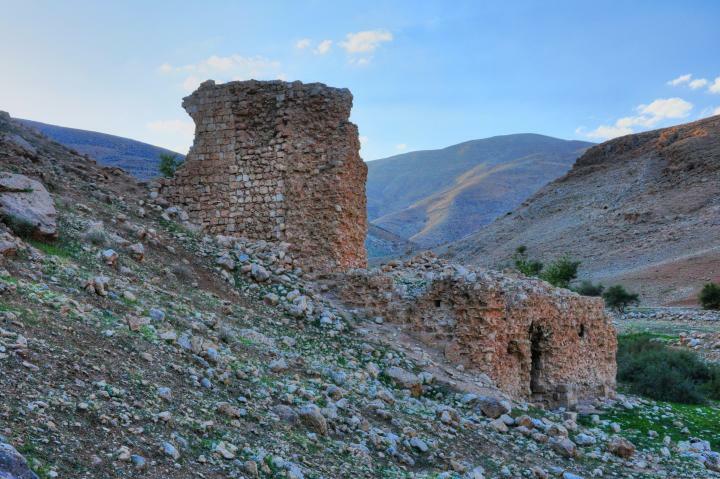 During the great revolt the town, like Jericho, was damaged by the Romans. 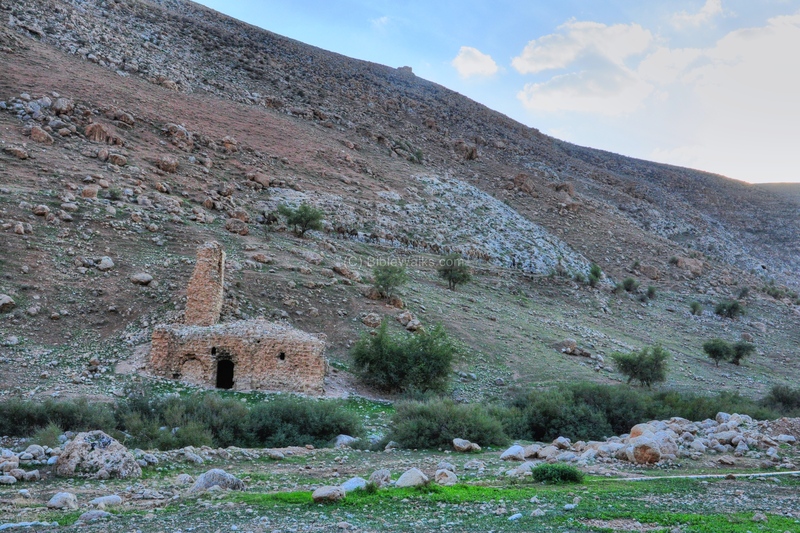 During the late Roman and Byzantine period, Fazael became a large agriculture village. Its residents were both Jewish and Christian. The aqueduct was maintained and repaired for hundreds of years, allowing the town to flourish. 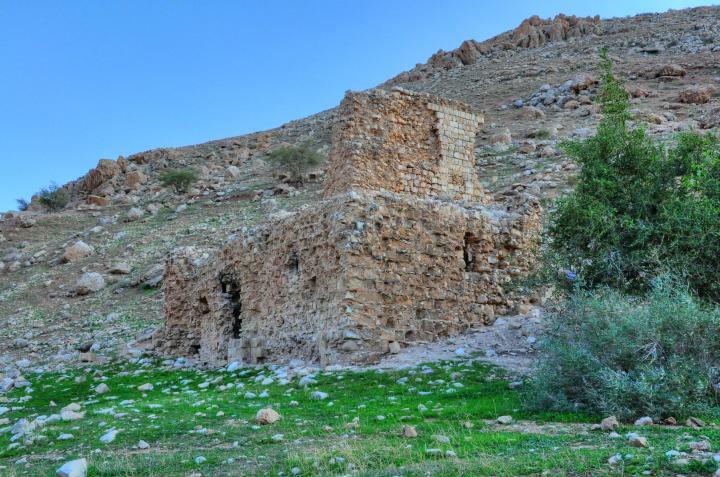 The Arab period did not affect the village, but it gradually declined after the Crusader period (13th C). The ruins of Fazael are located in Khirbet Fazael, on the south side of the modern Moshav Fazael. An Arab village was built at the end of the 18thC on the south side of the Roman town, called Fasail, which preserved the ancient name. 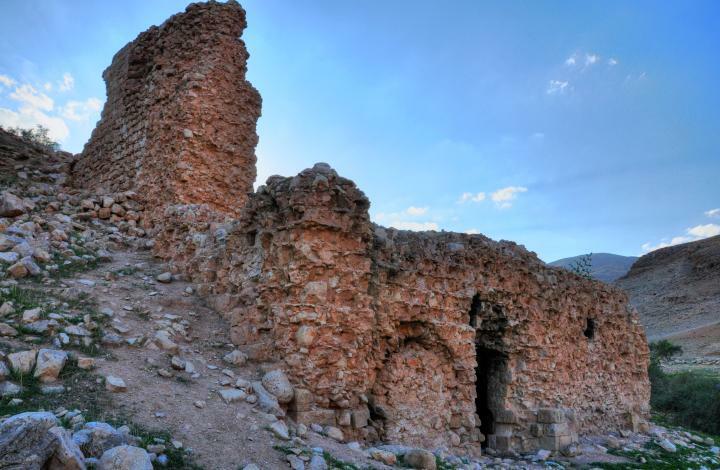 The villagers, of the wealthy Nimer family, came from Shekhem. The villagers reused the stones from the ruins of the Roman village, repaired the aqueduct and built a flour mill near the springs. The Jordan valley underwent a total reconstruction after the six day war (1967) under Israeli control. A new agricultural settlement, Moshav Fazael, was established in 1970, north of the ruins of the Roman village. The photo shows a westward view of the brook near the springs. An eastward view of the brook near the springs is shown below. The photo below shows the road near the Fazael springs. The dirt road up to this point is in a relative good condition and is accessible by a passenger car. Inside the brook are twin springs, called the Fazael springs. 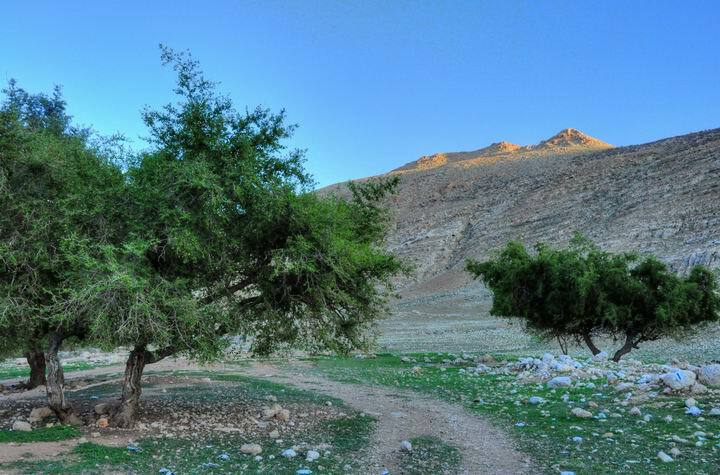 The trees around the springs are Arabian Jujube tree (Sheisaf matsui), or "Christ Thorn". According to tradition, Jesus crown of thorns were made from this type of tree. In the photo below are the ruins of the wall of a dam, once part of the aqueduct's system. The dam was first constructed in the Roman period, and repaired over the years. 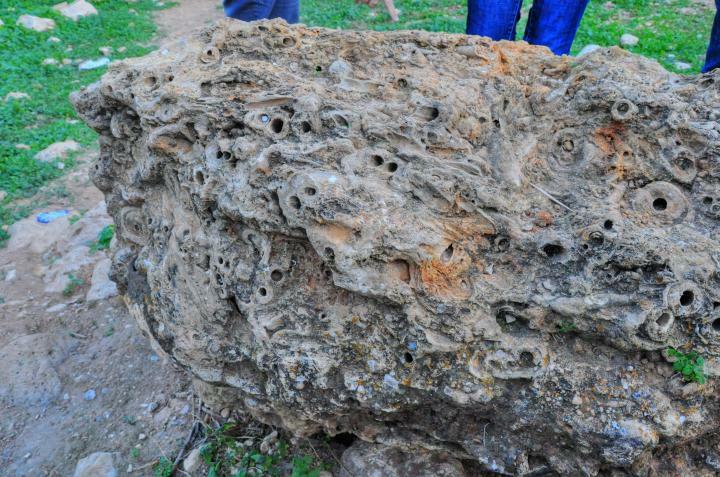 The top layer of cement is from the Ottoman period. The water from the springs filled a pool, and its waters were diverted to a water channel and flowed downstream through the aqueduct. A small pool is located near the base of the broken dam. Amit, webmaster Rotem's sister, sits by the refreshing waters. Around the pool are bushes of raspberry and mint plants. Near the dam is a large fossilized rock, as seen below. The ruins of an ancient flour mill is located along the brook. It was built at the end of the 18th C by the family that resettled near the ancient site of Fazael. The flour mill was operated by the falling flow of water, which was diverted from a water canal from the upstream dam. The water flowed through a canal and fell down on a wooden wheel that turned the grinding stone around - thus crushing the wheat into flour. Another view of the mill is seen below. The entrance to the mill is shown below. On the left side is the blocked water outlet of the mill. Uncle Ronnie, who joined us on this tour, stands below near the entrance to the mill. The waters from the springs were raised by the dam and channeled to an aqueduct. The aqueduct conveyed the waters to the Roman city of Fazael, about 6KM away, and was also used by the farmers for agriculture. 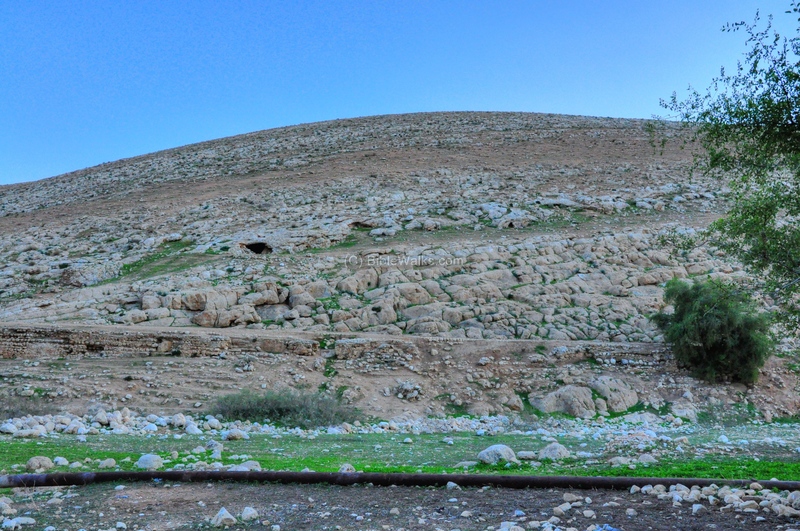 This section, near the dam, is from a later period, but the original aqueduct was laid out by Herod. The aqueduct, first laid out in the Roman period, runs along the southern bank of the valley. It can be seen in the photo below, running along a height slightly higher than the valley and maintaining a constant small slope. It is not in use today, but its dry foundation are clearly seen along the valley. 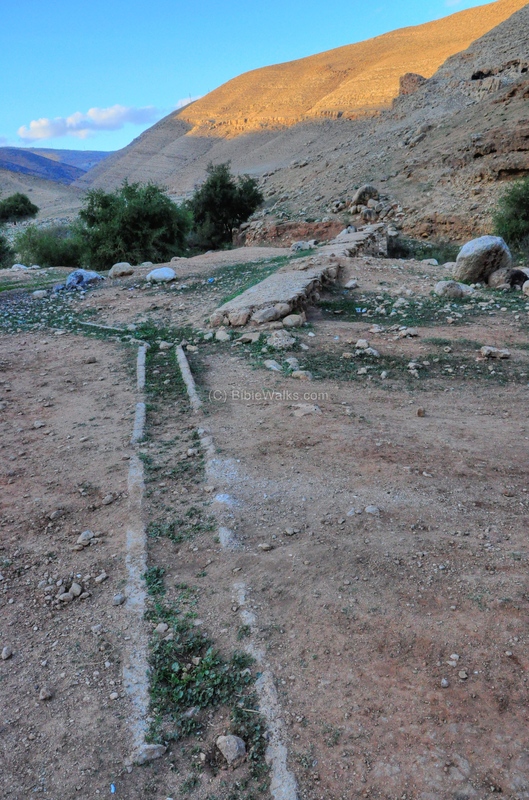 The aqueduct was replaced by a metal pipe which runs at a lower height and conveys the water to the Arab village of el-Fas'ail. The aqueduct even passes through a short hewn tunnel inside the rock (on the lower left side in the picture below). The photo below shows a lower section of the aqueduct, closer to the mouth of the valley. 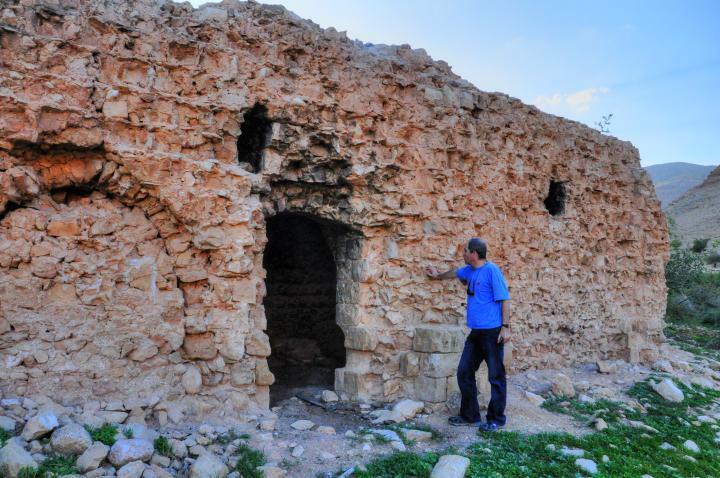 The first aqueduct was constructed during the Roman period, probably during the establishment of the city by Herod. The art of aqueduct engineering was perfected in the Roman period, and were one of the most important state projects that enabled the villages to grow. Over a 1000 years this aqueduct was repaired again and again, and supplied fresh water to the ancient city. The latest repair was in the end of the 18th C, and was based on cement (the highest aqueduct in the photo below). The small artificial mound at the edge of the brook is called in Arabic "Tell es-Sheikh Dhiyab". It was excavated in 2000, and was dated to the Iron age. 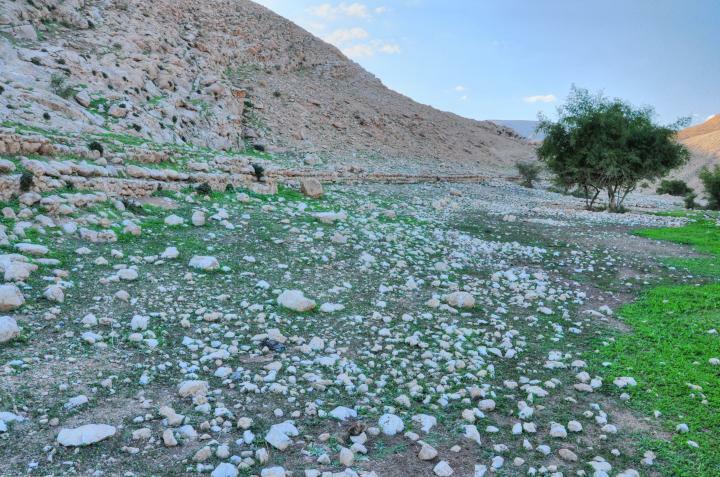 This site is identified by some scholars as Biblical Ataroth, part of the region belonging to the tribe of Ephraim (Joshua 16 5,7: "And the border of the children of Ephraim ... went down from ... to Ataroth..."). 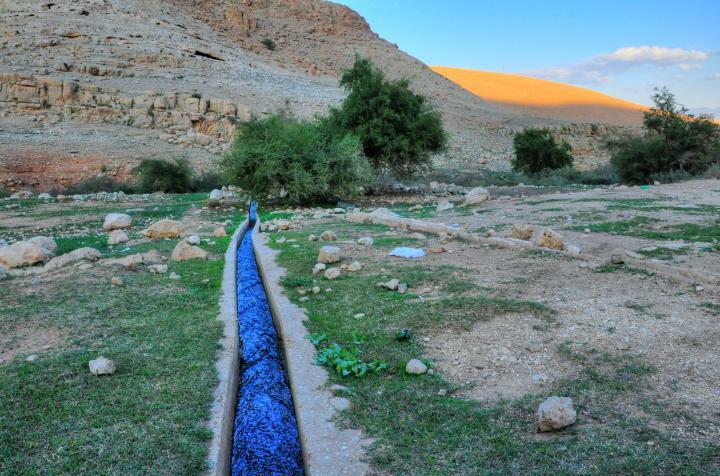 Its existence in this dry climate was based on the springs of Fazael brook. 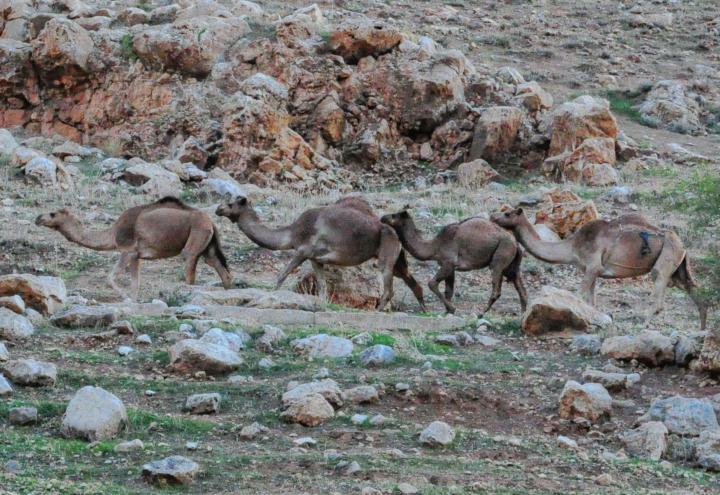 Above the mill, along the path of the aqueduct, a herd of camels passed by on their way to the Jordan valley. They were followed by a shepherd who was riding on a donkey in the back. 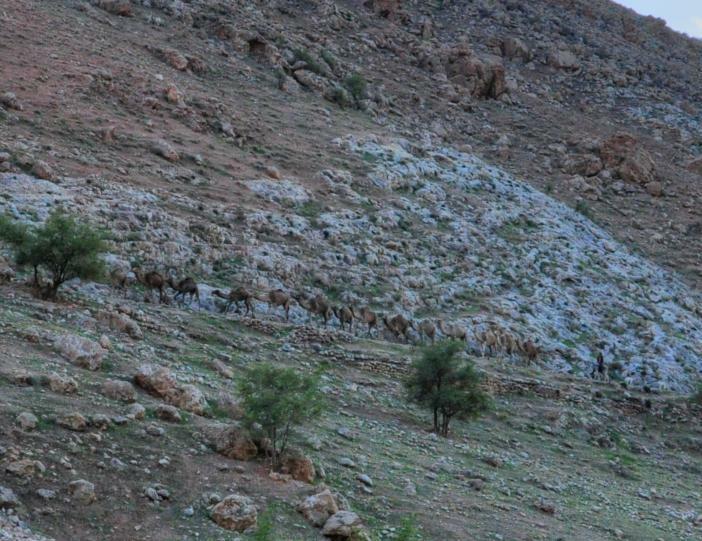 A closer view of the camels is in the photo below. For us, used only to motor cars, this was a magical scene, and so we rushed up the hill to see them pass by. 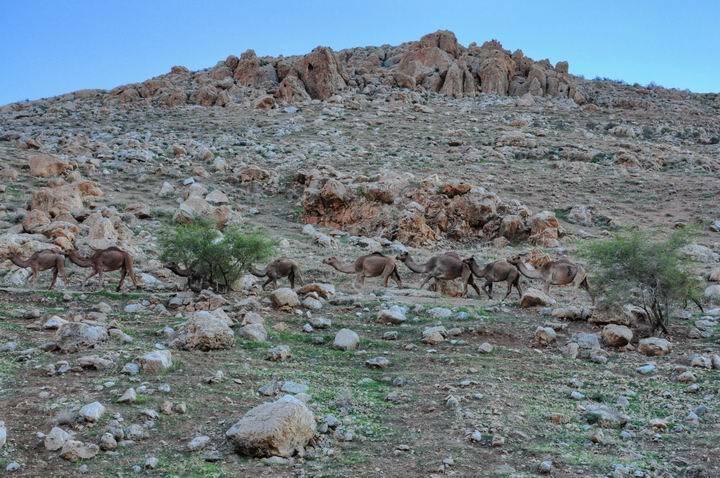 A closer view of the camels is in the photo below. The camel was one of the main transportation vehicle in the Biblical times, and is referred many times in the Bible while describing property (an important asset) or travel. Their ability of carrying heavy cargo due to their strength, the ability to handle the dry conditions of the desert area with few stops for water - made them the best pack animals in the ancient times. A typical number of camels (50,000!) and relative ratio to other beasts (25 more times than asses) can be seen in a description of the battles of Reuben tribe against the Hagrites (1 Chronicles 5 21):"And they took away their cattle; of their camels fifty thousand, and of sheep two hundred and fifty thousand, and of asses two thousand, and of men an hundred thousand". Fazael (Phasael, Phasaelus, Phasaelis) - A prince, younger brother of Herod the Great, who died in 40BC during the fight with the Parthians . 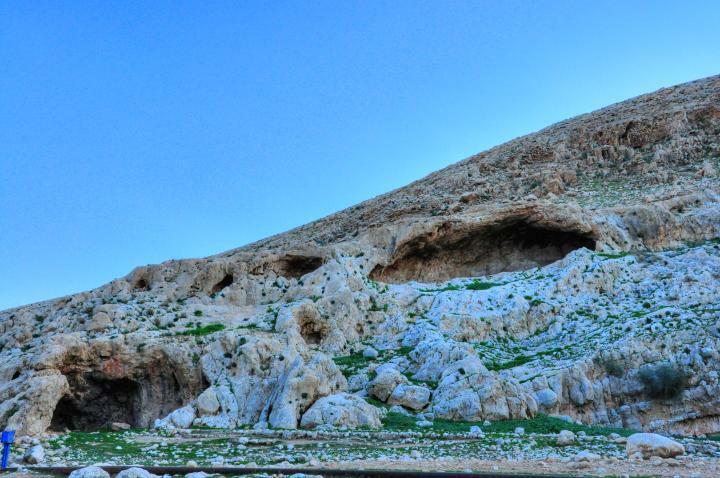 Herod, later a "King of the Jews" under Roman rule (37BC-4BC) named the new founded nearby city after his brother.